Bangladesh fast bowler Taskin Ahmed performs the hat-trick by yorking Sri Lanka’s last man Nuwan Pradeep for a duck. DAMBULLA, Tuesday – A maiden One-Day International century from Kusal Mendis and a hat-trick from right-arm fast bowler Taskin Ahmed was the feature of the second one-day international between Sri Lanka and Bangladesh at the Rangiri Dambulla Stadium which ended in a no-result yesterday when rain washed out play during the innings break. Dambulla expected to be a dry zone area experienced a rare occurrence of rain in late March soon as the Sri Lankan innings was terminated at 311, the last three wickets falling in a flurry to Taskin Ahmed who became the fifth Bangladesh bowler to perform the hat-trick in one-day international cricket. Bangladesh never had a chance to commence their innings as it rained continuously forcing the umpires to abandon the match at 8.45 p.m.
Taskin had Asela Gunaratne caught by Soumya Sarkar at mid-off for 39 and followed it up with the wickets of Suranga Lakmal and Nuwan Pradeep off the next two deliveries to finish with figures of 4 for 47. Before Taskin produced his magical spell in the final over of the innings Sri Lanka looked headed for a total in the range of 350 after winning the toss and batting first on a new pitch that had some grass and nice carry for the batters. Sri Lanka captain Upul Tharanga playing in his 200th ODI set his team racing towards a substantial total when he hit a sparkling 65 off 76 balls with the aid of nine fours. After losing his opening partner Danushka Gunathilaka for nine in the third over Tharanga joined by Mendis put together a century stand (111 off 133 balls) that laid the foundations for a big total. Tharanga was in fine fettle playing some delightful cover drives that pierced the heavily guarded off side field and when a century was there for the taking he suffered what is now the buzz word in cricket circles – a brain fade and was run out needlessly. Mahmudullah caught the Lankan captain napping with a smart piece of work to run him out off a no-ball. Tharanga strolled lazily for a single off a misfield by the wicket-keeper and found himself well short of the crease when Mahmudullah made a direct hit from short fine leg. Mendis edgy at the beginning blossomed out gradually to play a delightful innings of 102 off 107 balls that contained a six and nine fours. A few choicy words from the chairman of selectors Sanath Jayasuriya during practice put Mendis in the right frame of mind to make a contribution that was worthy of his talent. 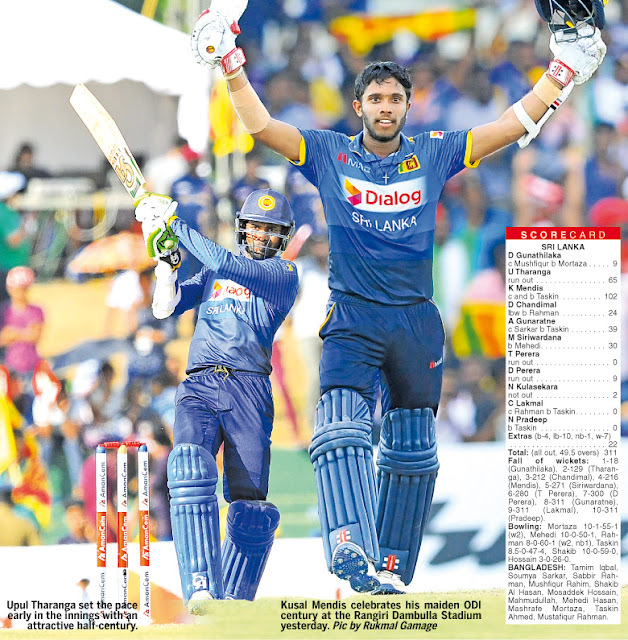 Dinesh Chandimal, Gunaratne and Milinda Siriwardana all contributed with useful scores that set Sri Lanka racing towards the 350-run mark but successive run outs of Thisara Perera and Dilruwan Perera trying to sneak singles to wicket-keeper Mushfiqur Rahim who made direct hits to the wicket saw them falter. Taskin ensured that Sri Lanka did not reach their intended target with a late spurt of fast-medium bowling that saw him join colleagues Shahadat Hossain v Zimbabwe (Harare) 2006, Abdur Razzak v Zimbabwe (Dhaka) 2010, Rubel Hossain v New Zealand (Dhaka) 2013 and Taijul Islam v Zimbabwe (Dhaka) 2014 who had performed the hat-trick for Bangladesh in ODIs before him. Sri Lanka who are trailing 0-1 in the three match series rang in three changes to their side following Saturday’s 90-run defeat with fast bowlers Nuwan Pradeep and Nuwan Kulasekara and off-spinner Dilruwan Perera replacing Lahiru Kumara, Lakshan Sandakan and Sachith Pathirana. Bangladesh remained unchanged. The third and final ODI (a day game) will take place at the SSC grounds on April Fools Day (Saturday).